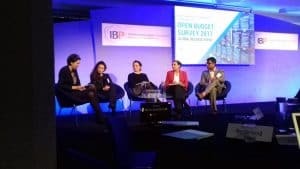 At the global release of the Open Budget Survey 2017 in Washington, D.C., and in this blog post, the Open Government Partnership’s Sanjay Pradhan tied the results to rising authoritarianism and closing civic space, drawing on research by Freedom House and CIVICUS. Similar links were drawn by Danny Sriskandarajah of CIVICUS at the London release event, where the U.K.’s Minister of State at the Department for International Development, Harriet Baldwin, also linked the findings to declining press freedom. Manal Fouad of the International Monetary Fund called the results disappointing but not surprising, evoking the more general malaise around poor transparency and declining trust in government that has taken hold in recent years. Other participants gave examples of related findings from their own work that confirm a trend away from open governance and democracy. For example, the World Bank pointed to declining Public Expenditure and Financial Accountability (PEFA) assessment scores and declining Country Policy and Institutional Assessment scores in West Africa. Colleagues from the Mo Ibrahim Foundation pointed to regression in their indicators of governance for Africa. At the U.S. State Department, officials spoke about lack of transparency of state-owned enterprises emerging from their own transparency assessments, as well as the importance of legislative oversight and the fact that international support for legislatures has been declining in recent years. Even as the Open Budget Survey 2017 findings evoke little surprise, they do raise fundamental questions of interpretation. Is declining budget transparency part of a syndrome of democratic decline, that is, just another indicator of decline? Or is it rather a cause (or effect) of other changes in the political and economic environment? Should we see these findings as early indications of a new trend, or simply an unfortunate step backward on an otherwise healthy trajectory? The same question could be asked of what we are seeing at the level of democratic regimes. Are the rise of populism, attacks on media, and the weakening of judicial independence in many countries the new normal, or will they cause publics to react and strengthen democracy in relatively short order? Explaining findings like stalling progress in the Open Budget Survey 2017 is a hazardous business. Political and social indicators are notoriously noisy. Genuine change takes time, and may take even longer to show up in the indicators we use to measure it. Although both democracy and income are correlated with Open Budget Index (the Open Budget Survey’s measure of budget transparency) scores in a cross-sectional analysis, the Open Budget Survey 2017 report suggests that there are no correlations between changes in democracy indicators or measures of country income and changes in Open Budget Index scores. This is not surprising: while being democratic and wealthy may be associated with greater budget transparency, it is unlikely that modest changes in democracy or income would explain modest changes in budget transparency over such a short period. There are nevertheless a few relationships worth further exploration. The first is between the Open Budget Index and a measure of deliberative democracy from the University of Gothenburg’s Varieties of Democracy data. This measure looks at the extent of public justifications from government officials for their decisions, which is a measure of the openness of decision making. We find that a decline in this measure is associated with a decline in Open Budget Index score. This is a rather nuanced measure of democracy, in the same way that budget transparency is itself a nuanced measure of democratic practice. The other correlation we find is between countries issuing sovereign bonds in 2016 and Open Budget Index scores: those countries that issued bonds appear to have had no change in scores, while those that did not fell by nearly six points on our index. This suggests that investors do have leverage over governments, although it is surprising that this leverage is only relevant at first issue: the data suggest that governments appear unperturbed by how their bonds trade in the secondary market (an improbable scenario, unless governments do not intend to borrow more in the future). Another finding, and perhaps the most revealing, is that countries in sub-Saharan Africa that had increased their Open Budget Index score by more than five points between 2012 and 2015 declined by more on average between 2015 and 2017 than the countries that were not substantial improvers between 2012 and 2015. This, and other analyses of volatility, suggest a tendency for countries to regress to the mean in their transparency practices. Other theories also circulated in the various global events that discussed the Open Budget Survey 2017 findings. A participant from the International Monetary Fund (IMF) pointed out that the period covered by the survey was a difficult one macroeconomically for a number of countries and that transparency tends to decline when economic news is bad. Others raised the fact that in countries that are fragile or insecure, the incentives to release information, the cost of doing so, and the priority attached to transparency are all likely to be affected negatively (a point also noted in the report, which shows the negative relationship between countries facing recent conflict and Open Budget Index scores). In London it was suggested that the increasing role of China in financing development globally might be leading to a declining emphasis on transparency. One participant at the D.C. event noted that we need to look at the positive trends in Asia as well as the negative trends in sub-Saharan Africa to understand what is actually happening to transparency. How will we respond to what we heard around the world? Our first commitment is simply to keep watching and establish whether what we have seen is a genuine trend. 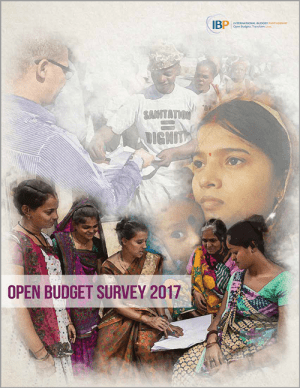 The results of the Open Budget Survey Document Availability Tracker (our interim measure of the public availability of budget documents, a key component of budget transparency) later this year, and the 2019 survey findings, will help us to understand better whether we are witnessing a new pattern, or the 2017 results represent an anomaly. We will also undertake additional research to understand whether the findings related to sovereign bond issuance hold over time and a larger number of cases. And we will also try to investigate further the declines in Africa (and increases in Asia) to see whether there are any more robust relationships that can be uncovered. This work can investigate some of the variables mentioned by participants in our events, such as the role of insecurity, China, and poor economic news in explaining changes in transparency over time. Beyond this, the results of the survey are already informing our next five-year strategy at IBP. One consistent finding from the survey over time has been that governments are less likely to release information during or after budget execution, and citizens and oversight actors are also less likely to use this information. We are undertaking a multiyear initiative on budget credibility that will look more closely at what happens during budget execution, raising questions about the extent of deviations from budget, and how well governments justify these. This, we hope, will help focus attention on budget execution and encourage greater transparency during the later stages of the budget cycle. A second area of further work is to continue to refine our understanding of how citizens use the information that is available to participate effectively in the budget process. A larger constituency of budget users is an important bulwark against regressions in transparency of the type we have seen in the Open Budget Survey 2017. It is also critical to ensure that budget allocations are aligned with public priorities, and these allocations are equitable. Public participation in budget processes will be given more attention as we collect more data through the survey on public engagement mechanisms over time, but we will also complement this with additional case studies of approaches that are working. And we will continue to build the field and help citizens to use existing mechanisms to participate. We believe that bolstering the case for participation, and helping governments and citizens to set up and use effective participation mechanisms, are part of what is needed to restore public trust in institutions and fortify democracy for another generation.